Ages of Astronomy is a 26 minute musical odyssey that takes general audiences on a fully immersive, 3D voyage into the colourful history of Astronomy. Utilising the most advanced 3D technology currently available, Ages of Astronomy will be produced for full dome digital theatres across the world. Ages of Astronomy will for the first time in this domain combine moving pictures and music score to colourfully document the Ages (and future) of Astronomy. In an active volcanic backdrop, see primitive man pointing giant bones to starry flecks in the night sky, travel through time to Egypt and witness a young boy king mapping the stars with his minions, transition through time again to witness ancient Greeks making star patterns of local Gods and myths, see the ancient Mayans working their astronomical stone calendars and then witness the Stonehenge alignments. Whiz through the last millenium as we discover stars, planets, moons and comets and witness the greats such as Gallileo, Copernicus, Kepler and Halley at work, and to recent times where we witness the Hubble telescope launch a new generation of space discovery...and to the future...witness moon based observatories and massive space faring telescopes and communication centres. 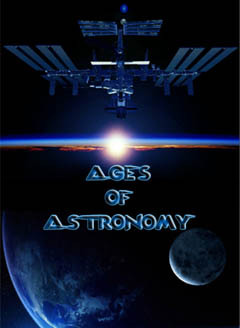 Ages of Astronomy will narrate its journey through song lyrics and visuals that indicate periods and events as we move through the ages commencing from prehistoric times and ending around 2250 AD. Using high end 3D animated sequencing, the visuals will 'morph' from one age to another seamlessly to present a smooth and well presented document that will educate, stimulate and entertain audiences of all ages.